Happy New Year to all TGS readers from Me and My Daughters (Diya and Neha). We wish you and your family a happy, healthy, and joyful new year. At TGS, our goal is to educate you on Linux and open source technologies on an on-going basis. With your tremendous love and support, we are committed in publishing high quality articles. Apart from the regular tutorials, I’m also working on several workshops that will be available for TGS readers this year. Happy New Year and Way To Go Geekstuff!!! Thank thegeekstuff, i learn a lot from thegeekstuff. Wish You the same to you and your daughters(Divya & Neha). Happy New Year to you and your family also Ramesh and keep up the good work. Wish all the same to you and keep on the good work. Happy New year to You, your Family and to our Geekians also. A very happy new year to you and your family. May this year fulfil all your dreams that were unfulfilled last year and also those that at yet to come. Wishing a Happy New Year to you and your daughters. Wish you all a very Happy New Year and many thanks for excellent knowledge sharing !!! please say your daughters that she have a great dad. i love your homepage and your claim to spread knowledge. Ramesh, Diya and Neha, I Wish a Very Happy New Year to you all. Just starting to learn Linux. Hope I am at the right place to learn. Happy New Year to you and your gorgeous family! Even if I don’t understand most of the Geek stuff I’ve still learned a lot from your postings. Many thanks for all the great stuff I learnt from you. Keep up the good work in 2017 too. Happy New Year to you and the dolls.And thank you for all you do. Best wishes in return, and keep up those nice and interesting posts! Wish you a happy year 2017 ! Happy new year 2017, I wish you all a year full of challenges and new stuffs to learn. Many thanks Ramesh for this page it’s truly invaluable. Wishing you and your family Very Good Year a head. Your share of knowledge is awesome, keep it going. Happy new year to you Ramesh and to every one who loves Linux and Humanity. Happy new year and Greatest wishes to you and your family! Wish you and your family a happy and prosperous new year 2017! Happy New year 2017 Ramesh and Family keep up the wonderful services for Linux and more. Linux should be the default OS for a country like India. Yet most of us are using pirated OS because there is no one to guide us. Why not publish some guides for softwares like WINE so that linux users can also communicate with windows users, who are as of now a overwhelming majority. The worst part is that our government is also using proprietary software like XL, forcing us to install windows. Wish you and your family a very happy and successful new year 2017 ! Also , I wish happy new year to the entire Linux community. Onwards to 2017. Wish you and your family a happy new year. New Year wishes to you & family…2017..keep up the good work..
Beautiful picture. Happy New Year!! Looking to increase linux knowledge and python skills. happy new year and merry cristmass to your family and you. thnak for work you do for learning. good wishes. Thank you very, very much Ramesh for the work that you are doing and for the information that is being provided. You have a lovely family and I extend sincere best wishes to you and them for 2017 and beyond. I hope that 2017 will be a very rewarding year for all of you. Happy new year for you and your daughters too. Thank you very,very much Ramesh for the work that you do and for the information provided. You have a lovely family and I sincerely extend my best wished to you all for 2017 and beyond. I hope that 2017 will be a very rewarding year for all of you. Looks like a wonderful family! Happy new year, Ramesh! Happy New Year’s to you, your family, and the staff. Thank you for all you do. First of all wishing you a happy new year. This site is really helpful from beginners to intermediate level. Thanks a lot for making this available, hope we would like to see BIG DATA related topics and others in this year. Happy New Year to you and your family, too, Ramesh. Happy new year and advance Pongal to you (Ramesh Natarajan) and your family. I wish you the same. A Very Very Happy New Year to You and Your Family with Diya and Neha and God Bless You All, Linux is the best thing that has happened to Computer Users. Wish You All The Best For All Future Works You Do. 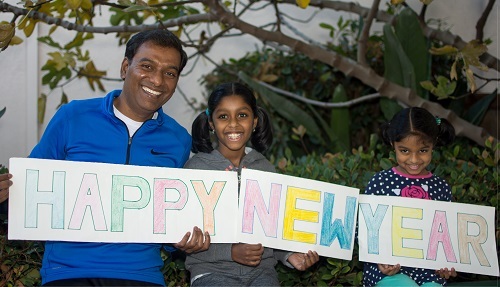 Ramesh, Happy new year to you and your daughters (Diya and Neha). Appreciate the good work that you are doing, may your knowledge never stop flowing. Wishing you and your family the best of life this year. To the audience a wish for a New Year filled with new learning and exciting projects. Thanks much your ever growing library of tech. Have a blessed new year!!! Happy new year friend. I’ve been a long time reader. Keep up the good work. Hope your family is doing well. Happy New Year Ramesh and Diya and Neha. Happy New Year to you and yous!! Happy New Year to you and your family. Great photo. Happy New Year to you and your family, Ramesh, and thanks for the great articles. Your daughters are, indeed, dolls. Very lovely. Thank you for your work. I’ve learned a lot about linux from your many articles. I wish you a prosperous and healthy new year. Very happy new year, best wishes for you and your family!!! Thanks for all the time you spend preparing material and excellent tutorials for the world wide community of students and those in the software field. I appreciate it and may you have a great new year. PS . Great picture of your family! Happy New Year to You and Your Family Ramesh. Beautiful Family. Wish you and your family happy new year. Thank you very much. Wishing you and your family a happy, safe and healthy 2017! Happy New Year and thanks for the great work! Thank you so much for your work! I have much to learn about Linux and your expertise has been guiding me! Happy New Year! Happy new year to you, your wonderful family and all the friends here. I really do appreciate your work, useful for beginners as well as professionals. Thank you for all your contribution and wishing a happy new year to you & your dolls! I have a couple of granddaughter dolls myself. You are a lucky man! Con mi agradecimiento por la información compartida, dejo mis mejores deseos porque este sea un año exitoso, productivo y lleno de bendiciones para ti y tu familia. With my thanks for sharing information, I wish you all the best because this is a successful, productive and blessed year for you and your family. Happy New Year to TGS stuff! Happy New Year to you. Thank you for your work on this very useful and informative website. Thank you very much and Happy New Year with best wishes. The same to you !! Thank you for commitment to Linux education and Happy New Year to you and your lovely family. Happy new year to you and your family, your frends and all readers thegeekstuff! Happy new year to all the reader, to you and your family. Hi Natarajan, wish you and your family a happy new too…. Happy New Year TGS, thanks a lot for your excellent blog! The Best of new years to you and the Dolls! May you prosper, and benefit from the knowledge you have given me. Thank You so Much! Wish you the same dear. Neha is looking so cute. Ton of thanks from my side your doing such a great work. I am following you from past one year and I learnt a lot of things from the geekstuff.com . I am very much interested to work with you to educate myself and to others. Feliz Año Nuevo!!!! (Happy New Year) to you and your family. Happy new year for you en your lovely daughters. I wish you a happy & Prosperous New Year. I wish for all of you a HNY filled with loft of blessings. Ton of thanks from my side your doing such a great work. I am following you from past four year and I learnt a lot of things from the geekstuff.com .